Today is Bastille Day, the annual French celebration of storming prisons and liberating hundreds of deserving criminals. As we speak, this year’s breakout has seen no less than four hundred benefit fraudsters, petty thieves and mimes flood the cafés and galleries of Paris, smoking Gitanes and complaining about the food. There’s no better way to mark the occasion than with a drink, but I’d been having some trouble pulling things together until I spotted a carton of cherry juice in the supermarket. It’s a little bland and quite dry by itself, but add a touch of gomme and a decent measure of Cognac, et voila! Stir all ingredients with ice and strain into an ice-filled rocks/old-fashioned glass. 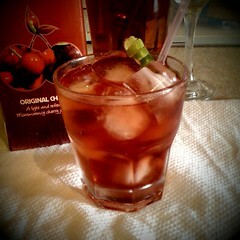 Garnish with a lemon zest twist and a cocktail cherry.